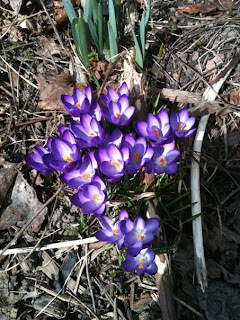 Above is a picture of our crocuses that Howard took and posted on Facebook. I love a man who will take pictures of crocuses. Plus he brought in the garbage tote. It was out because it was garbage day and when I got home it was parked neatly in the back yard. The crocuses are a delight to see! Also observe our neatly tended garden. I could have burned calories today gardening but instead after work I walked around Delaware Park wearing shorts for the first time this year. There is nothing like wearing shorts for the first time every season. My legs are so pasty white! When I was in California with Leonard Pennario I got so tan. Pennario approved. I held onto that tan for about a year after he died but my second winter back home has done it in, I am afraid. I know we are not supposed to get tan but I think here in Buffalo we cannot do ourselves much harm. Anyway I never go out of my way to tan. I just let it happen. But I did do a little gardening today anyway. After admiring our crocuses I noticed it was time to harvest a bar of Lever 2000 soap. It was in the garden by our driveway. We have a bathroom patch there. Other people have cabbage patches but we have a bathroom patch! The deal is, we have a group home next door. There are aggressive sounds that issue from the house, a guy bellowing angrily. We think this guy is the one who hurls things out the bathroom window. Because there are always things lying underneath the bathroom window and they could lie there for weeks without anyone picking them up. So sometimes we harvest them, otherwise they will get all overgrown. We have acquired two towels in this fashion and two bottles of VO5 shampoo. And today I picked the bar of Lever soap. A tan in Buffalo... does the lake ever get warm enough to swim in? I know we have a lot of people that come here (VA Beach) to vacation on the ocean because (they tell me) their own ocean is too cold, lol. The 'bathroom patch' is cool!